Two things: There are no typos in that headline, and we think this is genius! As a marketer, I have personally followed marketing thought leaders for decades. One that recently came across the path is Mark Addicks, the former CMO (Chief Marketing Officer) for General-Mills. Addicks, in work he did with The Big Know out of Minneapolis, illustrated the high value of being at the intersection when your buyer first enters your category. Well clearly IKEA has taken that idea and put it on steroids. 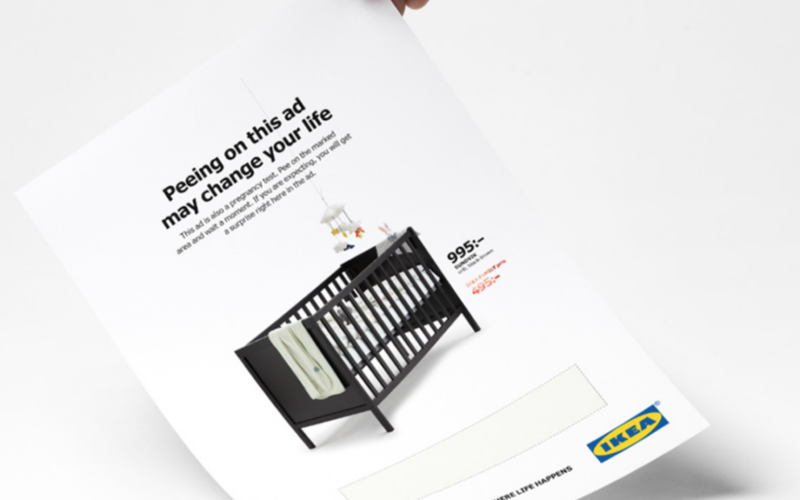 This print ad uniquely puts IKEA right at the very moment a new buyer realizes they have a need. This is fascinating. This is creative. This is innovation. This is thinking so far out of the box that it may have been accomplished with the use of hallucinogenics. This is brilliant. We haven’t quite figured out how the pee soaked coupons get redeemed at check out, but here’s to hoping someone thought that through. Either way, the campaign is making a splash!